In the medical device world, it’s not uncommon to get hung up on documentation. “It takes too much time.” “It’s throwing us off our concentration.” “It doesn’t push innovation forward.” – these are all excuses we’ve heard over the years, and they’re just that: excuses. Documentation is a foundational part of the medical device industry, and the growing dependence on strong documentation processes has left many organizations looking for ways to update and fine-tune their documentation strategies. Note: Click here to learn more about Greenlight Guru's medical device specific Advance Document Management software with Part 11 compliant e-signatures, flexible approval workflows, revision control and more. Our first horror story comes from an early stage medical device company that was going through the design and development of a new device. This particular device included several 3D closures, and the company built prototypes of the closures to ensure that everything worked the way it should. These prototypes served as the basis for tooling quotes. As anyone in the medical device world knows, injection-molding tooling is notoriously expensive and has a pretty lengthy turnaround time. For this particular order, there were four different tools ordered, each costing the company around $20,000 and taking up to 12 weeks to be delivered. Now, when it comes to tooling, each component fits together in a specific way, which is why most tooling suppliers send along an article for review before sending the actual tooling. This article requires explicit sign-off from companies to ensure all the components are correct. In this case, the company quickly looked at the article for review and failed to compare the tool to the design documentation and drawings before signing off. Once the tools were delivered to the contract manufacturer, things weren’t lining up. When faulty tools are delivered to a manufacturer, there are two avenues of action: you either send the part back to the supplier or you employ rework to make the part work for your design. In this case, the company decided to give rework a try, which required weeks of trial-and-error to find the right design in-house. The company ended up wasting money on faulty tools, delaying the time-to-market for their new device thanks to all of the new work, and increasing spend on overhead resources (such as manpower) to modify the existing tools in question. In the end, this entire situation could have been avoided with a documentation inspection at the review stage. Had the company actually leveraged their documentation, the tooling mistakes would have been caught during the review and updated before sending to the manufacturer. Contrary to popular belief, documentation isn’t a rule that’s meant to hinder innovation – it’s the process of capturing information about products, processes, and components to help fuel innovation. The company in this example readily had their documents available and up-to-date, but when it came time to actually leverage this information they fell short. This second horror story features a more established company and takes place during an audit, one of the most stressful times for any medical device company. I was called in (while working as a consultant) by this company to help mitigate the situation. He quickly realized that, with three days to go until the audit, there was little left to do except to understand the processes in place. At some point, the company in question (and this goes for other organizations in similar situations as well) just needed to acknowledge and admit they hadn’t been doing a good job with document management. In the event of an audit or inspection, it’s extremely important not to try to lie or mislead the inspector on your case. FDA inspectors and ISO auditors can quickly identify fishy situations, and lies can quickly spin out of control. One of the most common parts of an audit is the review of CAPAs, to give inspectors a better idea of what happened, how it happened, and how the issue was resolved. Typical auditors look at 3-5 CAPAs and then determine if there needs to be any further investigation. In this particular case, the inspector highlighted a particular CAPA for review, and the internal document runner went off to find the CAPA in question. This meant hunting down a printed-off document in a binder or file cabinet, since all of the company’s CAPAs were documented via paper. In the end, the runner could not find the requested CAPA anywhere, even after checking people’s desks, file cabinets, and other storage areas. This was a pretty critical record that had up and gone missing. Realizing a CAPA is missing at any time is a big deal, but realizing it when you’re in the middle of an ISO or FDA audit is probably the worst timing for it to happen. When I had to tell the auditor that the requested CAPA was missing, the auditor was understandably disappointed and gave the company a 483 observation. In this case, the CAPA had actually been recorded and simply misplaced, rather than not recorded at all; however, the company never found the original CAPA file and had to re-do the entire documentation process retroactively. This meant they had to dedicate nearly 30 hours of manual work that had already been done initially in order to make up for the missing report. Because the company had to go back and re-open the CAPA review process, they also reassessed the manufacturing process, parameters, and tooling guidelines as well. Needless to say, with a solid documentation process in place, this entire situation would have been completely avoidable. Our final documentation horror story comes from a company that was going through a design review. Typically, when medical device teams go through the design verification process, multiple teams come together in a room with all of their individual data and documentation to review each other’s information. It’s not uncommon for this to include hundreds of pages of report findings and details. In this particular case, the company was dealing with multiple patient-focused components and bio-compatibility reports that were frequently more than 15 pages apiece. These documents are pretty dense and discrepancies aren’t always clear right off the bat. At its core, design verification is about confirming you designed your product from the beginning, and that there is the correct alignment between the parts required and the end product. During this particular design verification meeting, there was no formal design control traceability matrix to monitor the input and output requirements; requirements which literally made up a mountain of paper on the table. So, everyone on the team signed off on the design and got ready for the next step in the process – sending in the 510(k) on a pretty tight timeline. Once the regulatory affairs representative came in to prepare the 510(k), it was clear this was an overwhelming job. She not only had to go through hundreds of pieces of paper, but also had to leverage server folder trees to find missing documents. It quickly became apparent that one report, a particularly important bio-compatibility test report, was unaccounted for. The 510(k) submission would be rejected without this report, and yet the internal team had signed off on the design. Without a design control traceability matrix, the design had been pushed through without the correct documentation. The company had to go back and actually do the test, wasting valuable time in the process. Becoming overwhelmed by documents and paperwork to the point something slips through the cracks isn’t necessarily an uncommon occurrence in medical device companies, but it can have dire consequences. The company in question had all of the right documents and even had them all out for inspection, but still missed a critical component because of lack of organization. At Greenlight Guru, delivering this organization and visibility is what motivates us every day. In the world of medical devices, if it’s not documented it simply did not happen. The industry as a whole is quickly moving away from the days of ‘documentation as a hassle’ to ‘documentation as a form of communication’ and documentation is truly a form of communication. It lets your employees, company, stakeholders, the government, and others know the why and how behind the product you’ve created. In the first use case, the company lost track of the importance of documentation in the tooling ordering process. With an innovative design management solution, design review requires sign off and documentation, ensuring nothing ever slips through the cracks. In the second example, missing CAPAs and poor audit planning resulted in unnecessary stress and citations for the company. With Greenlight Guru’s CAPA workflow, everything an organization needs for a CAPA inspection is organized and housed in a single place, with status updates, attachments, and more. Plus, since you cannot delete any regulatory data or CAPA results from the Greenlight Guru platform, companies have access to the data they need, even for last-minute audits. And finally, the last horror story starring the design control traceability matrix. Traceability is now an industry best practice (as evidenced by its inclusion in ISO 13485:2016) and the best product development teams are using this method of document management. A traceability matrix allows teams to start documenting devices and design processes at the beginning, not the end, so they can see the actual thought process in action and identify what needs to be addressed. 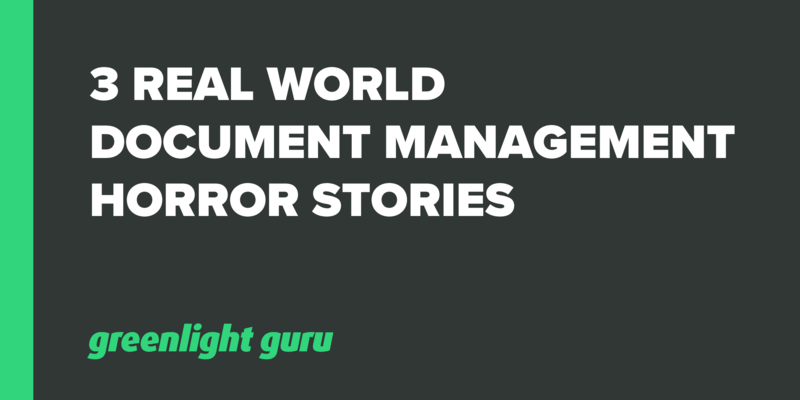 In all three of the aforementioned horror stories, a clear documentation management process was missing. Had it been there, it could have helped these organizations save time, money, and stress. Documentation management is the new normal for high-functioning medical device teams, and knowing what not to do is the first step towards building a compliant, efficient document management process.